It’s not even one day actually. If you think of going to Parapat to see Lake Toba for just a day, that, my friend, is digging your own graveyard. 😛 The trip to Lake Toba (Parapat side) will take around 4.5hours for one way, I wrote about my trip from Medan to Lake Toba – Parapat here; it’s in Bahasa but you can always ask Uncle Google to help translate it. 😛 Double the one way trip and you need 9 freakin hours just for the trip to and fro Parapat. 9 HOURS!! You’ll end that trip with a messy hair and make up. OH NO! 😦 There is no way you can enjoy the scenery and what it offers in just couple of hours. But worry not! I just realized something when I did the trip to Gundaling Hill and Sipiso-piso Waterfall that you can actually SEE Lake Toba from the Tongging Village side there! HAHAHAHA. I was like ‘Wait, what’s this Mom?’ when I saw the huge lake. Just when I knew it’s Lake Toba (but from the other side from the one I visited a year back) I was in awe. That lake is not just huge, it’s humongous!! Me and bujendral, my mom, started our one day out of Medan to Gundaling Hill and Sipiso-piso Waterfall at 7.30AM from my fave hotel in Medan, d’Primahotel. Review of d’Primahotel Medan is available and yes it’s also in Bahasa. Hihihi. Just across Sipiso-piso Waterfall, we saw the magnificent Lake Toba (first picture up there is Lake Toba from Tongging Village!). Hehehe. 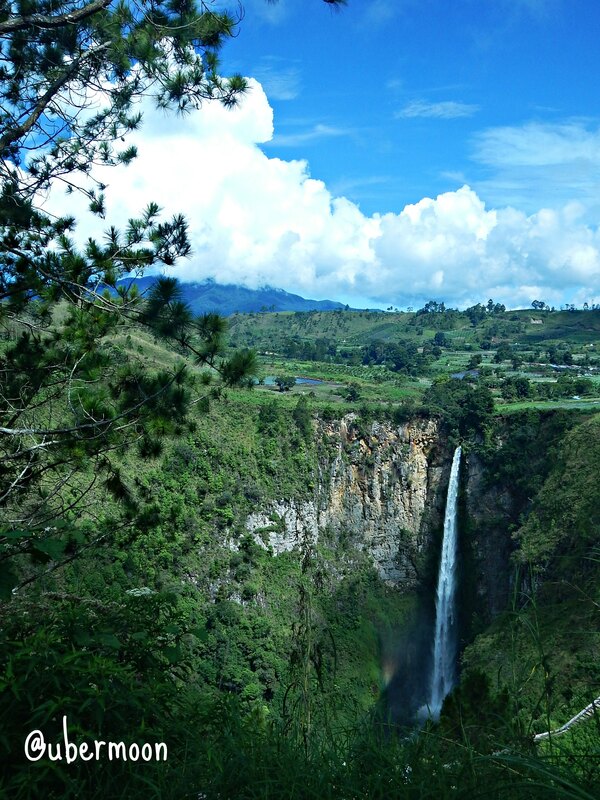 After spending some times at Sipiso-piso Waterfall and Lake Toba, we continued our trip to Gundaling Hill in Berastagi. For you who play Monopoly when you were young it means we’re of the same age, do you remember that Berastagi is the most expensive stop in the game? Playing Monopoly, whenever my friend move the pawn near to Berastagi stop, I squeaked. Hahaha. The trip from Sipiso-piso Waterfall to Gundaling Hill took around 1 hour. 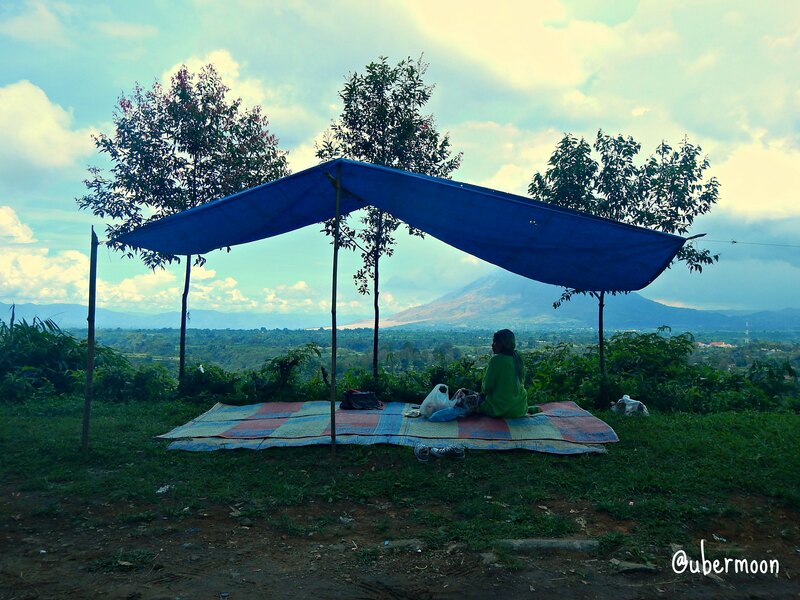 In Gundaling Hill, we can rent a minimalist hut at the side of the road, overlooking two mountains, Mount Sinabung and Mount Sibayak. This is my view at lunch that day. Jelly much? Hihihi. We spent quite a time there. There are several activities we can do in Gundaling Hill. We can go up and see the view from higher point. ride a horse, drink coffee at the humble shop available, or spend some times in one of these smaller huts. 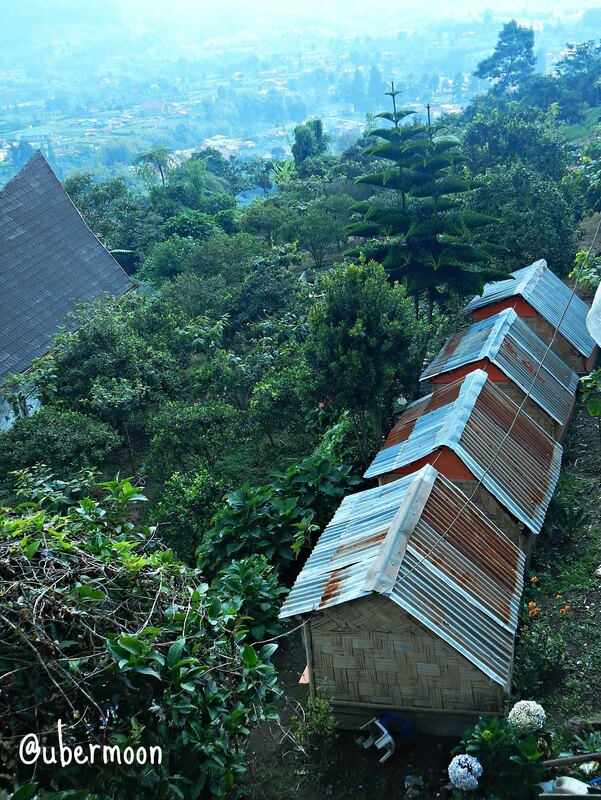 😛 What are those huts for? We finished the trip at around 3.30PM and drove directly to airport after that. The traffic was on our side, it was a smooth trip back and we even still had couple of hours to spend in Medan area near the airport. Considering the choir by the ascaris lumbricoides in our tummy, we decided to eat first at a local fried chicken place near the airport. Mom suggested this place and that was a great suggestion. The fried chicken is yummeh! Gnom! 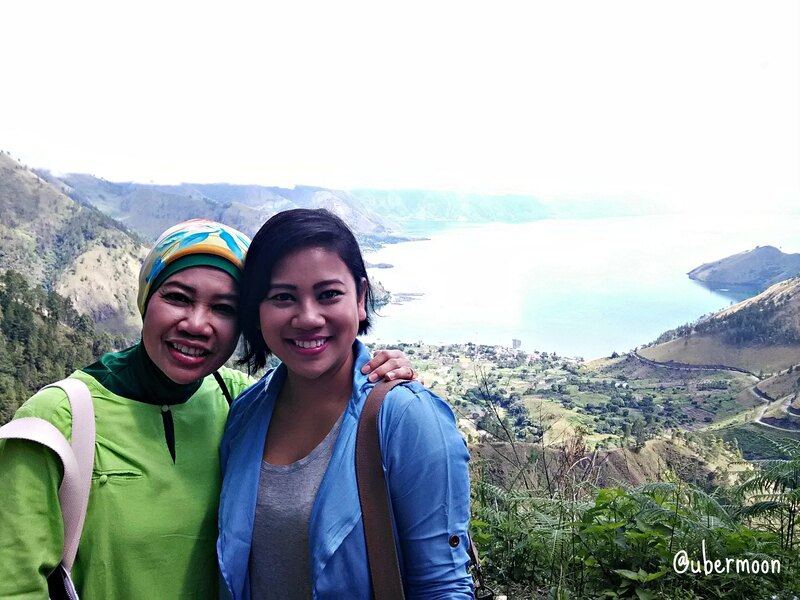 So that’s the story of Ubermamajourney trip to Gundaling Hill and Sipiso-sipiso Waterfall. In less than 20 hours, we visited two sites and got three major sightseeing. 🙂 Happy happy!! As an uber socialite (uhuk, choke choke), spending weekend in town is just too usual. 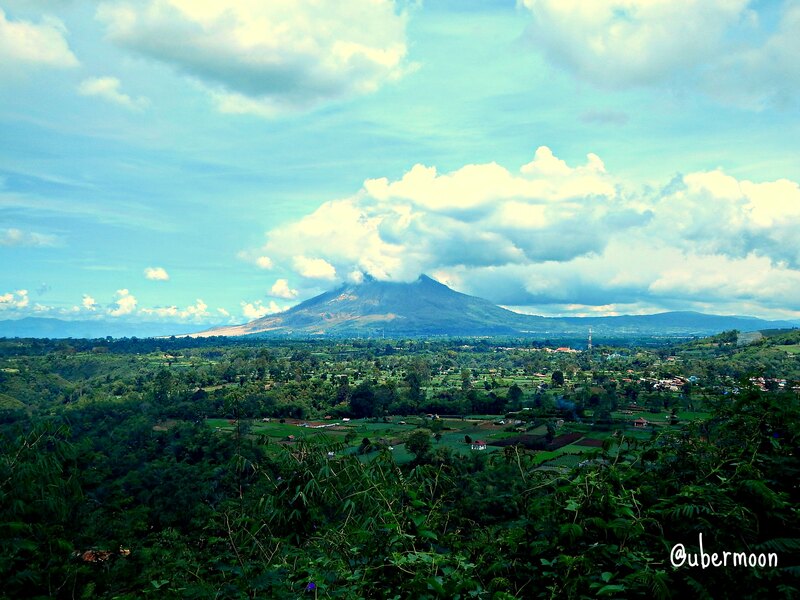 I take it to the next level by spending weekend outta town in North Sumatra. Hahaha. If I can do it, you can do it too. Join me in this socialite scheme and get to Diamond by earning 58000 points of make up purchase! *multilevel marketing words at the end* *faint* Hihihi. I will definitely go there one day. beautiful!! You should def visit it! It is lovely! !